Lina, Lina (2005) Kesehatan Mental Remaja Yang Pernah Mengalami Upaya Aborsi. Skripsi thesis, Universitas Tarumanagara. 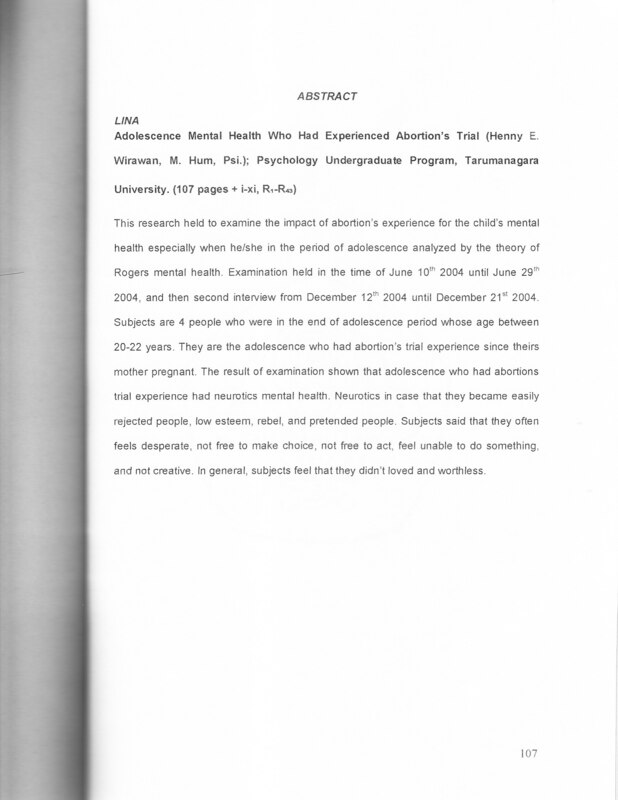 This research held to examine the impact of abortion's experience for the child's mental health especially when he/she in the period of adolescence analyzed by the theory of Rogers mental health. Examination held in the time of June 10th 2004 until June 29 th 2004 , and then second interview from December 12th 2004 until December 21st 2004. Subjects are 4 people who were in the end of adolescence period whose age between 20-22 years . They are the adolescence who had abortion's trial experience since theirs mother pregnant. The result of examination shown that adolescence who had abortions trial experience had neurotics mental health. Neurotics in case that they became easily rejected people, low esteem, rebel, and pretended people. Subjects said that they often feels desperate , not free to make choice, not free to act, feel unable to do something, and not creative. In general, subjects feel that they didn't loved and worthless.